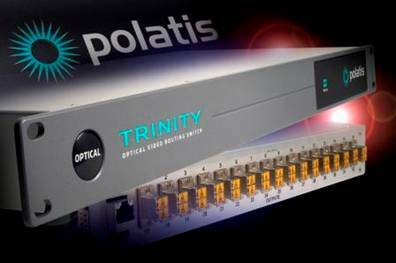 Cambridge, UK, and Boston, MA – August 4, 2008 – Polatis Inc., a supplier of high performance optical switch technologies, has announced the appointment of Boxer Systems as UK distributor for its TrinityTM family of optical video routing switches, designed for the broadcast and post-production industries. Trinity offers unlimited data bandwidth and transparency to any format or protocol - analog, digital and RF. Polatis selected Boxer Systems as it brings both technical excellence and a longstanding relationship with many of the UK's top broadcast customers. "We are seeing considerable demand for high-end optical transport solutions in the global video and broadcast markets, driven by the need to distribute quality high definition video," said Sean Gordon, Director of Sales, Video Products, at Polatis. "This targeted distribution agreement will allow Polatis to capitalize on the demand." "We are proud to work with Boxer Systems as they are a leader in their field and have strong relationships with the top players in this space. They offer sophisticated systems integration services, of which our optical switch product can become a key element and be well represented by Boxer's technically oriented sales and marketing team." Marc Risby, Director of Technology, Boxer Systems, added, "As our customers begin to implement fibre infrastructures with the growth of HD, they will need low loss switching technologies. The Polatis product range meets this need, offering flexibility to a wide variety of signal types and scalability to handle ever-growing video data rates." The Trinity series is designed specifically for the video transport and broadcast market. It supports virtually all protocols and feed rates - AES, SMPTE-276M, 259M, and 292M, ASI/DVB, NTSC, PAL, QAM, and others. Under-pinning the Trinity design is Polatis' unique beam-steering technology. Unlike other photonic solutions, Trinity can establish and maintain connection routes without a signal present, in a pre-provisioned 'ready and waiting state'. Not relying on an optical signal feedback to maintain the connection also means no modulation is introduced to the signal, a feature valued by customers who use Polatis products for RF-over-fiber applications today. Like all Polatis products, traffic can be bi-directional, and carry single or multiple wavelengths. Boxer Systems, founded in May 1990, provides professional representation, distribution and systems integration services to technology leaders/manufacturers of high quality, high performance digital products in the broadcast, film, post-production and television industries. Our prime focus and philosophy has always been to promote the highest quality digital products, support and services, that has been the basis of the Company's successful growth and reputation. Our customers range from the high end and middle range film and post-production facilities to broadcasters, corporates and production companies across the UK and Ireland.